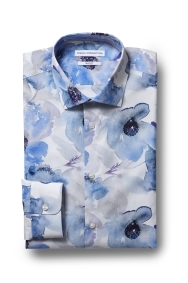 A bold shirt that will definitely liven up your outfit. 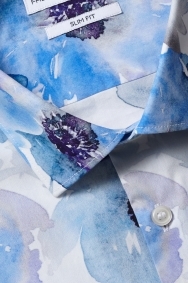 With its bright floral pattern, this is a shirt that will get you noticed. It’s cut in a slim fit to give you a defined shape and to complete your close-fitting suits. The small collar adds another on-trend element and keeps you looking sharp when you wear it open necked. The 100% cotton material means you’ll feel comfortable no matter what the occasion. Wear with a navy 3-piece suit and a silk white or pink pocket square for big events. You can wear it for more low-key occasions by choosing a 2-piece. Lovley bright floral patren .great material and feels lovley .another to my collection .